Chili La Plata and Uruguay. / South Part of Patagonia. 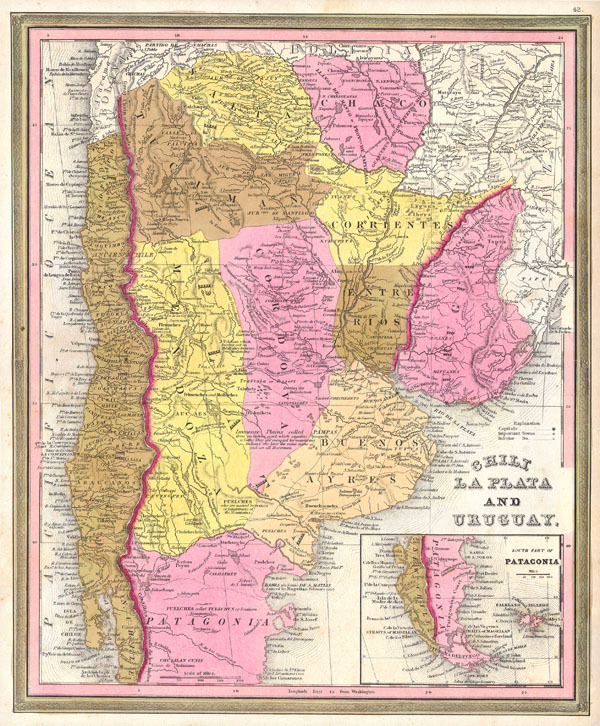 This scarce hand colored map is a lithographic engraving of Chile, La Plata and Uruguay, dating to 1846 by the legendary American Mapmaker S.A. Mitchell, the elder. Mostly depicts modern day Argentina. There is an inset of Patagonia and Tierra del Fuego on the bottom right. There is no engraver listed, but this is most likely a Burroughs map. H. N. Burroughs is a mysterious transitional engraver, whose work for the Mitchell firm appears in 1846 between that of H.S. Tanner and Mitchell himself. Ristow notes, 'Nothing is known about Burroughs, but he was undoubtedly an employee or associate of Mitchell.' His fine and detailed work appears only in certain hard to find mid 1840s editions of the Mitchell's Atlas.